The Federation of National Organizations states that the country is now facing a time that is more decisive than the time during the war. 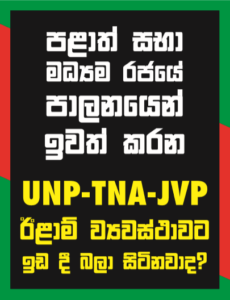 Convenor of the Federation Professor Gunadasa Amarasekera made this statement while participating in a ceremony in Colombo yesterday. Several representatives participated in the event titled ‘Let us not allow a new Eelam plan’. LTTE international network had strengthened human smuggling activities in Sri Lanka after the war, international terrorism expert Prof Rohan Gunaratna said. Gunaratna who is also head of the International Center for Political Violence and Terrorism Research (ICPVTR)] at Nanyang Technological University in Singapore said the phase of human smuggling changed after 2009 when the LTTE focused on smuggling its remainning memebrs in the country to several countries in Asia and the West.